I tasted 105 Washington State red wines for this column, and choosing the wines listed here proved one of the most difficult selections I’ve ever had to make. Across the board, quality was remarkably high, and in the case of some wineries—Andrew Will, Cadence, Pepper Bridge—every single wine I tasted was first-rate. That’s a rare result for any tasting, and a testimony to how exciting Washington state wines are right now. And although these wines aren’t inexpensive (some are quite pricey), the best offer quality equal to top reds from California’s star regions, often at about half the price. Washington’s wine regions mostly lie in the flat, rural, southeastern part of the state (the miniscule Puget Sound appellation, with a mere 80 acres of vineyards, is the lone exception). The largest by far is the Columbia Valley AVA (American Viticultural Area), which covers almost 11 million acres, nearly a third of the state. Other AVAs are much smaller—for instance, Red Mountain, an up- and-coming source for some of the state’s best Cabernet Sauvignons and Merlots, covers just 4,040 acres. 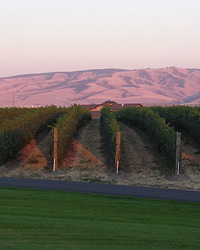 While Washington produces an abundance of both red and white wines, including some of the country’s best Rieslings, its growing reputation is based on its reds. Generally speaking, Washington’s Cabernets tend to be less full-bodied than their California counterparts, with more red than black fruit character: Think Modigliani rather than Rubens. Washington’s Syrahs often have a peppery gaminess that recalls France’s northern Rhône instead of the sweet, dense fruit that warmer climates give. And the state is arguably the best source in the U.S. for Merlot—top Washington Merlots have a spicy complexity and lush depth that, if the world were fair, would negate the sad reputation this grape has been saddled with over the past few years. Winemaker Pete Hedges fashions this plummy, straightforward blend of Merlot, Cabernet Sauvignon and Cabernet Franc with fruit from three different Red Mountain AVA vineyards. Washington’s Horse Heaven Hills region has a climate similar to that of France’s Châteauneuf-du-Pape, helping to give this Grenache-based red blend loads of peppery, dark cherry flavor. Merlot sourced from some of the state’s top vineyards, like Seven Hills and Tapteil, is blended with Cabernet Sauvignon, Cabernet Franc and Malbec to make this streamlined, berry-rich red. Coffee and smoke aromas mingle in this brooding, powerful red from Cabernet specialist Rick Small, a pioneer in Washington’s Walla Walla Valley appellation.